This is a recipe based on one by the great Jamie Oliver and the original is available online at his site. I love well cooked lamb, the way the juices flow from the intensely flavourful meat together with the texture with real bite, well roasted is simply the quintessential British dish. This is my idea of cooking on a Sunday; instead of sitting there basting meat, sweating over potatoes or cutting up veg, this dish is entirely prepared in advance and then just left in the oven for four hours. That’s four hours down the pub, entertaining your guests or making love to your wife. After which, you will be presented with a lamb dish fit for a king and tasting succulent enough to entice even the most ardent beef fanatic. I have made this dish many many times and there is a knack to it and a few simple rules that can really help turn this into something special. 1 large high sided roasting dish. Silver foil enough to cover the above twice. Wine costs a finite amount to market, bottle, ship and tax. Say that out of the cost of your average bottle this amounts to £2. So if you pay £4 for the wine, half the money that has gone out of your pocket was not spent on the making of the wine. More often that than not, all things being equal, this will mean that the wine maker had less ability to make a good wine. If, however, you pay £6 for the wine, now as before £2 goes into the marketing etc, but now a whole £4 goes to the wine maker enabling him to make a better wine. So for only adding £2 to your wine choice you are gaining a £4 value in the potential quality of the wine. Of course, there are exceptions in everything and super markets can reduce wines to clear, some areas can have a reduction for currency fluctuation and indeed some growers cant make a good wine with £20 in their pocket, but it is a rule of thumb that works and is used in he wine trade itself. I find it very accurate when buying wine made in Europe for example. So which should you go for? Well, I think that heavy wines are out, they will overpower the meat. So no Pinot. Nothing with too much fruit, so no shiraz. You want something that add a velvety taste to the dish, but at the same time you want something that pleases the red wine drinkers with a hint of the most commonly drunk wine types. 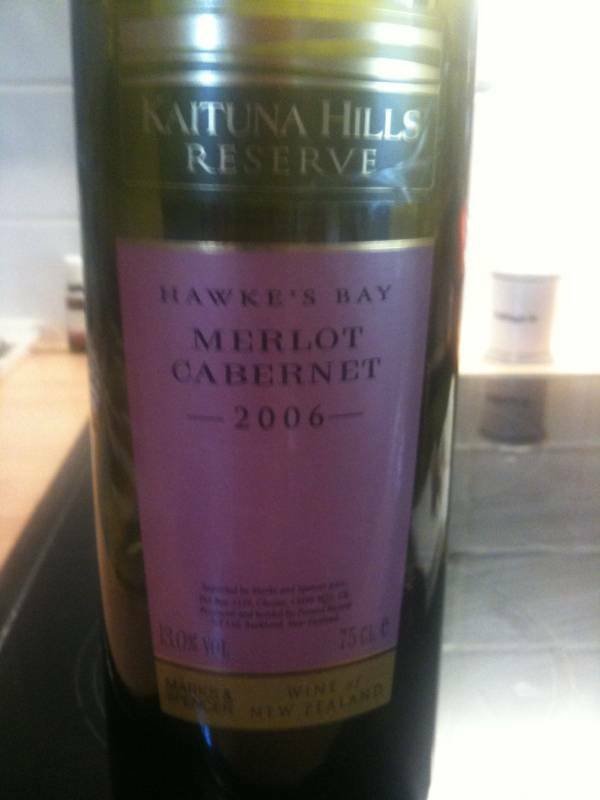 So, to that end I usually chose a Cabernet mixed with a Merlot. Well, yes to the character in Sideways the Merlot is the worst of all wines, and the entire Merlot producing industry took a hit thanks to that idea presented as fact in that otherwise excellent film. The facts are these. Firstly, the worst wine in existence to the be found in the Carrefour shops at French ferry ports. It is the one in white 3lt drums with dubious label, “Red Wine” affixed on them. In wine terms they are the equivalent of the 3-minute-warning and contain nothing that is fit for drinking. I watched a documentary on the subject of this “wine” that would make your eyes water. Secondly, there are good wines in every possible variety and basing your drinking choices on the grape type only is going to lead you to the wrong way and straight into the arms of the ever so slightly unscrupulous major producers who are quite willing to rest very firmly on their laurels and produce wines that vary massively over two or three years. This is that I bought for this dish, it cost £4 from M and S.
Firstly, preheat your oven to 200ºC/400ºF/gas 6. Do this first. Lamb shoulder can sometimes be very very fatty. To combat this trim a little of the thickest positions. Sure this fat will melt and become taste, but there is a tipping point where the fat saturates the entire dish. So trim a little, but leave enough to roast with. 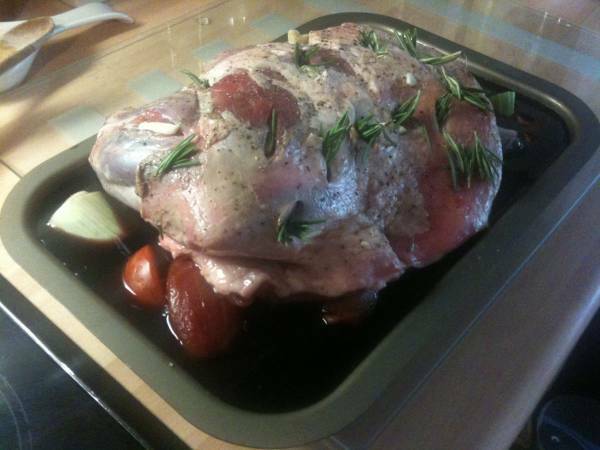 Rub the lamb with the Olive oil, some sea salt and freshly ground black pepper. 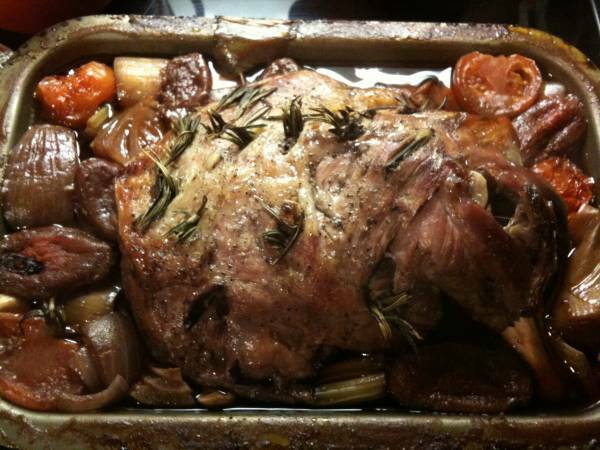 Cut small incisions all over the lamb and poke rosemary leaves and quartered cloves of garlic into each one. Put the rest of the garlic cloves, onions, carrots, celery, leeks and tomatoes to the tray, then tuck the remaining herbs under the meat. If you need to you can leave the dish at this point cover with cling film and it can sit for a few hours. Cover the tray tightly with a double layer of foil. Make sure to tuck the foil tight against the rim of the tray, if possible you want to make any leaks unable to run down the side of the disk. Put it into the oven. If you are at all worried about leaks of wine into the oven, put a silver foil sheet under the disk to catch the drips. Turn down the oven temperature to 170ºC/325ºF/gas 3 and cook for 3½ to 4 hours. You are looking to make the lamb soft, the fat to have melted and the bone just able to pull out of the shoulder. Pull out the worst excesses of twig. Season with salt and pepper if needed! Don’t miss this step! This is a big dish. The wine should have firmed up a little and be a sauce, the veg should have retained a little bite and the herbs should have added a great flavour. I always heat my non-metallic plates in the microwave. I take off the meat and cut the lamb like bread. 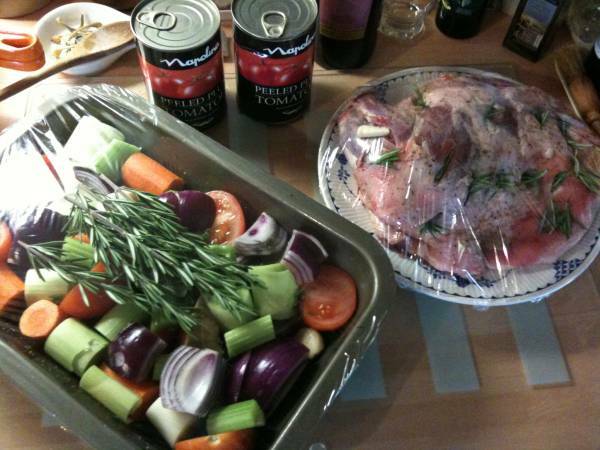 I then lay the meat and spoon over the sauce and veg. You could do a little mash to go alongside, but believe me, you don’t need to. Perhaps some bread to mop up, but again people are not going to be hungry after this. Please feel free to add any comments you have about your experiences with the dish, so any thing you think I may have missed. Please do check out Jamie’s website as well as original credit is his.